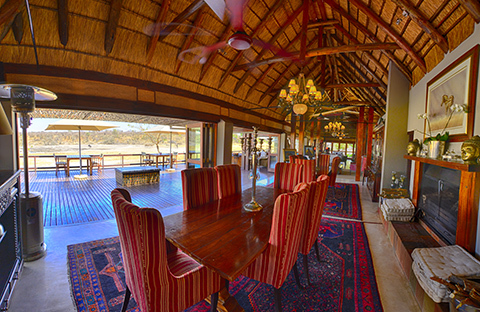 Jamala Madikwe is an owner-managed & run, 5-star luxury lodge. 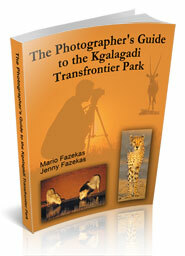 Jamala Madikwe is situated just 290km from Johannesburg on the south east border of Madikwe Game Reserve. The lodge can be most easily accessed via the Molatedi Gate. 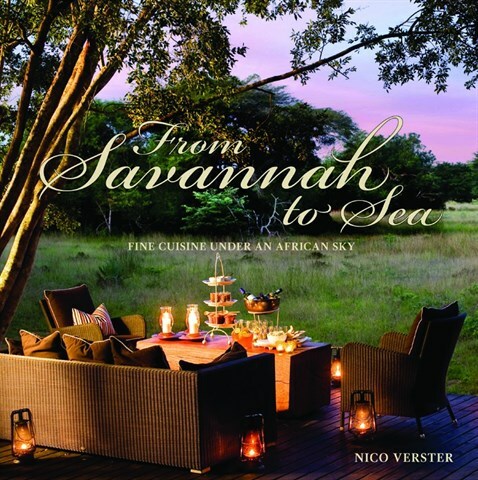 It is an exquisite 5 star lodge that is owner run and managed by Rodney and Nico the GM, whose aim is to make your stay an unforgettable one and they do just that in style! 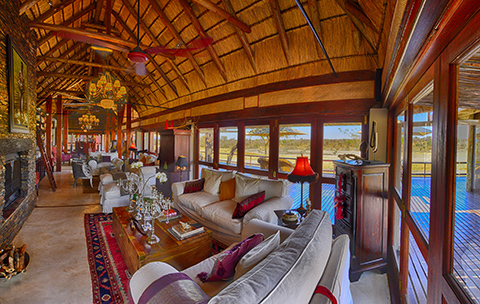 The stunning thatched main building overlooks a large waterhole which is frequently visited by elephant, lion, giraffe and many other animals. 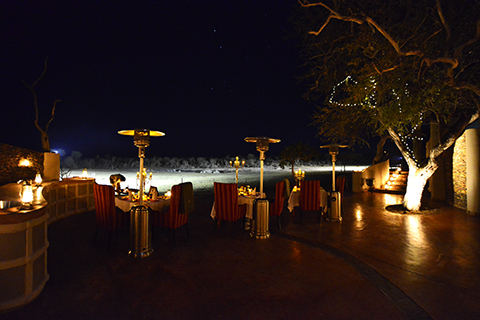 Jamala is Swahili for “Natural Elegance” and that is exactly what you see and feel when you stay at Jamala Madikwe! After our very warm welcome by Rodney and the team, we were given warm face cloths to wipe our dusty faces and a refreshing welcome drink. What nice people - we immediately felt at home and we could feel the stress draining out of us. 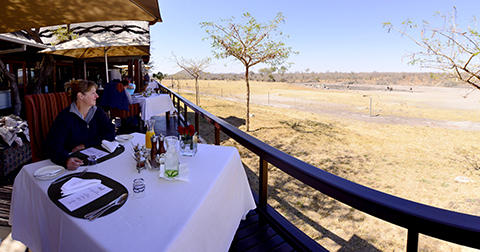 You have wonderful panoramic views of the waterhole and open savanna from both the lounge and dining areas where large folding glass doors bring nature to you. We enjoyed the view from both the wooden deck and the watch tower which is a stunning vantage point. 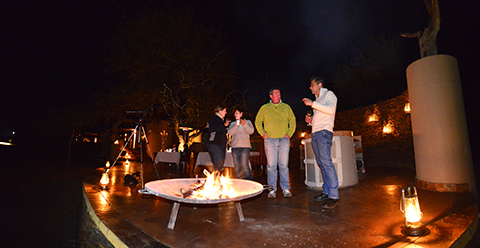 The main lodge building has a relaxing indoor lounge with large fireplace and library, dining area with fire place, plus an outdoor undercover lounge where you can enjoy a Sofa Safari - and that is just what we did...! We sat and watched the number of animals increase as the day got hotter. You don’t need to leave the comfort of your sofa, just sit back and relax. Free Wi-Fi is available from the lodge and villas. 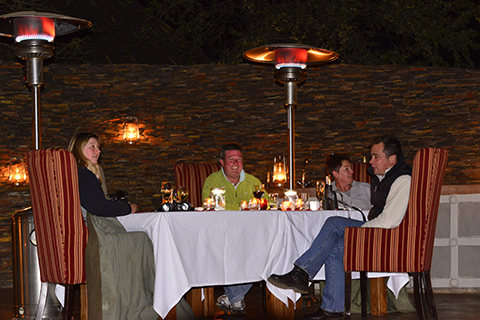 The meals were sensational and we thoroughly enjoyed every one. At dinner we received a menu with a list of all the guests, the date and what will be prepared that evening. 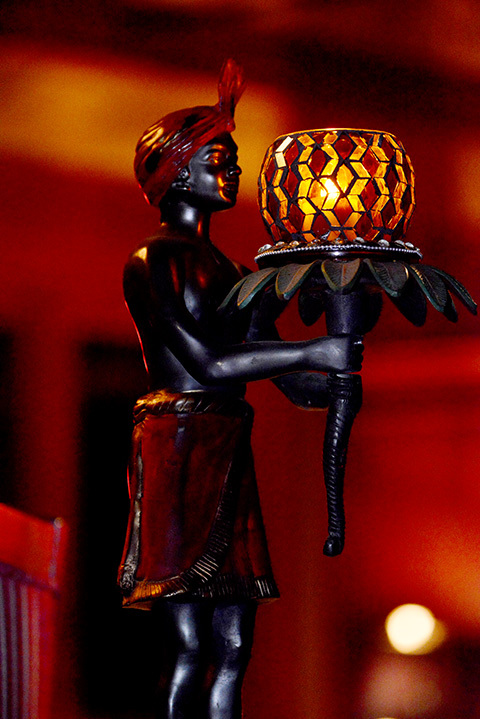 Each evening you would have a choice of two main courses. 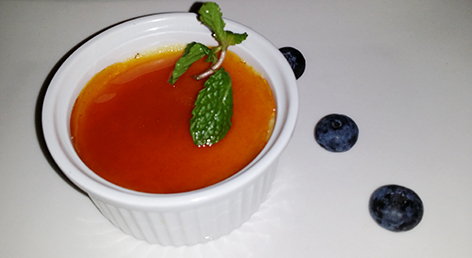 We had hearty African bean soup (delicious), then I had the roast duck ragout on tagliatelle with parmesan for my main and Mario had the beef shin “osso bucco” with creamy mash potatoes and vegetables and then we had vanilla crème brulee. 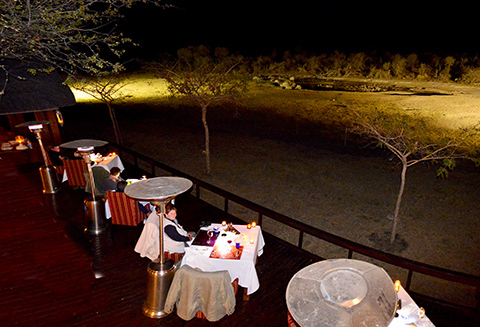 Each meal is an occasion at Jamala Madikwe; the scrumptious high teas are served just before your afternoon game drive in the outdoor lounge. 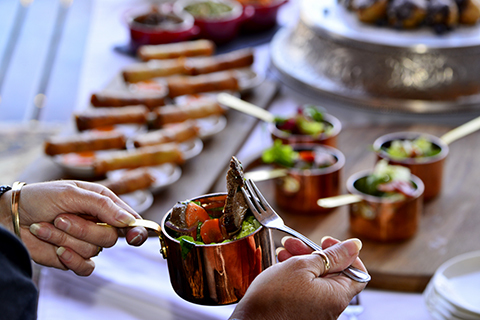 High teas at Jamala are not slapped together - they are quality events that are not to be missed! 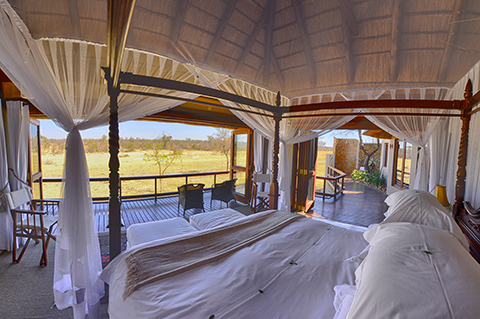 all of which have views overlooking the waterhole. 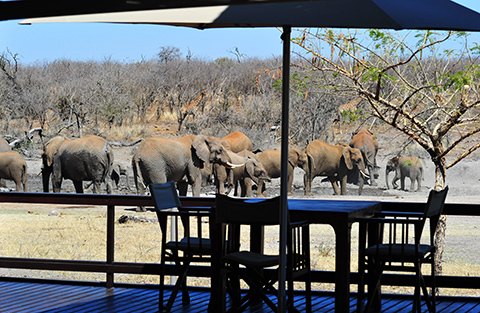 Breakfast is served on the wooden deck after your morning game drive. I enjoyed the cucumber water each day that is provided with your stunning breakfast; eggs of your choice, crispy bacon, mushrooms, grilled tomato, pastries, toast and tea and coffee. 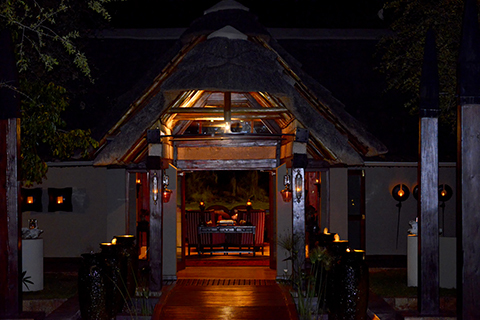 A gravel pathway leads from the main lodge to 5 exquisite free standing villas all tastefully decorated; these magnificent villas are very private and equipped with all the luxuries a discerning traveler could wish for, we just loved all the space! There is a four poster king size bed, separate cosy lounge with fireplace and dining area, private wooden deck and rim flow pool with loungers, writing desk with personalised stationary, complementary mini bar with tea and coffee station in the dressing room, en suit bathroom with large bath, indoor shower plus a lovely outdoor shower, air-conditioner, paddle fan, hair dryer and safe. The villas are beautifully spaced for privacy and each villa has large folding doors that open up to give you a feeling of being at one with nature. 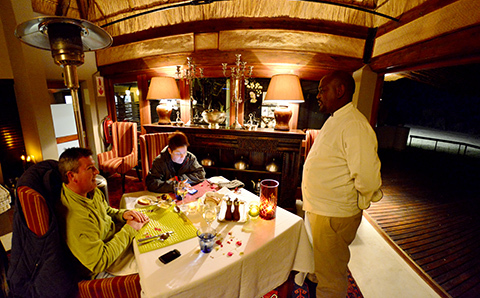 Each night we were given a bed time message and chocolates - what a lovely touch to end a fabulous day in the bush. 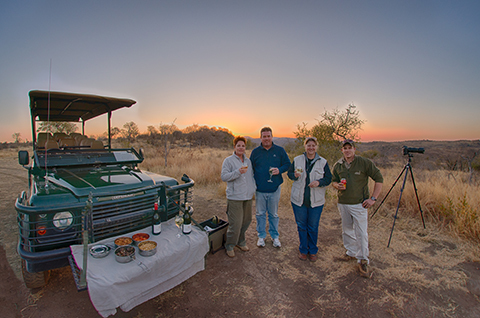 There are 2 game drives in open game viewing vehicles each day, with two very knowledgeable Safari Guides. 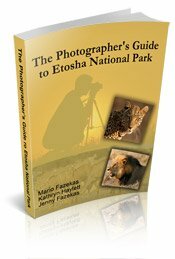 A quick cup of coffee, tea or hot chocolate before the early morning drive - with a short coffee break in the bush and for the afternoon/evening game drives you will stop somewhere special in the bush for sun-downers and snacks. 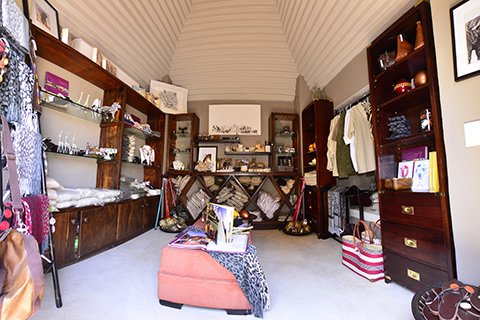 During those colder months you will be given hot water bottles, blankets and hand muffs to keep you warm during your game drives. 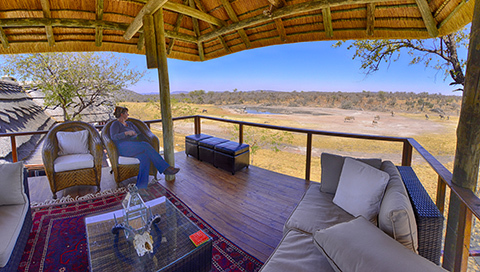 The viewing tower is a great place to observe what is happening at the waterhole and gives you a great panoramic view of the surrounding bush. 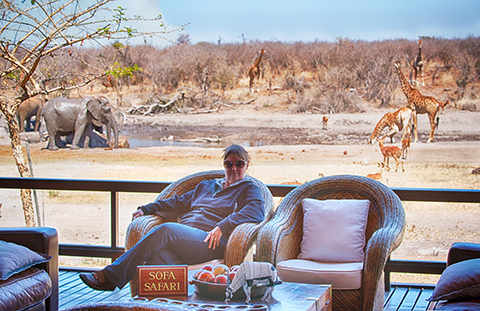 We sat there watching the animals go to and fro from the waterhole both at night and during the day. 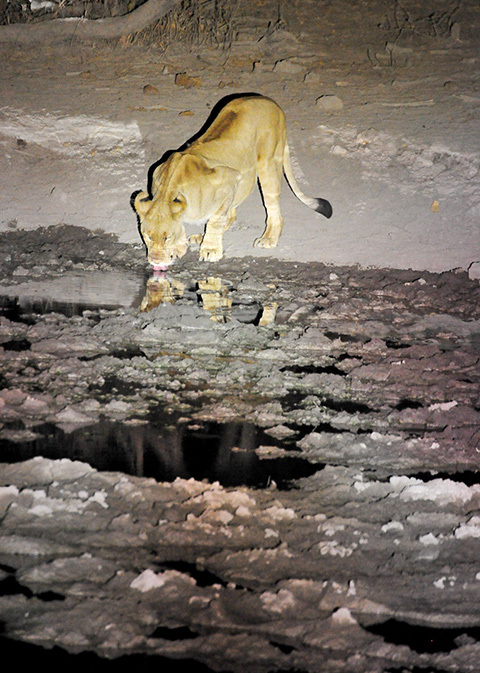 We would pop up there after dinner to see what was at the waterhole and one night we saw both brown and spotted hyenas sneak in and on another night a lioness. 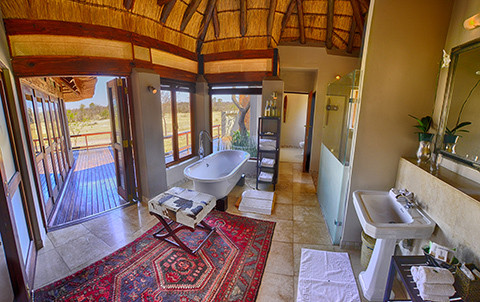 Cool off in the privacy of your rim flow pool or have a relaxing treatment at the wonderful spa…if you are feeling a little more energetic have a work out at the gym next to the spa while watching the waterhole or visit the small but very well-stocked curio shop. 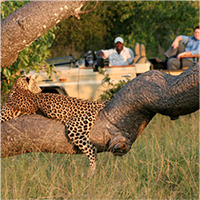 We had great sightings of the Big 5 plus Wild Dog and Cheetah during our 6 game drives. 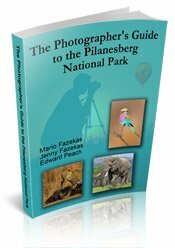 We saw a springbok on the open plains, large herds of elephant, both brown and spotted hyenas, large herds of buffalo, lions and plenty of rhinos. 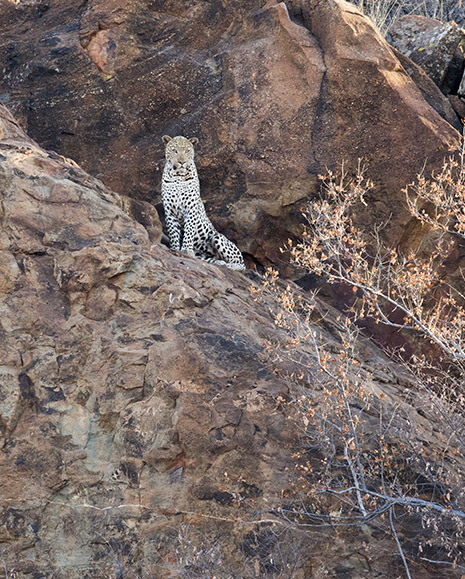 The highlight for us was the leopard on a rock but you can see more images on our trip report page. Rodney, Nico and team you made us feel like part of the Jamala family, thank you for not just a wonderful stay but for a beautiful experience, we cannot wait to come back.